Back when we reviewed the inaugural release of Bob Dylan’s Heaven’s Door whiskey, we titled that post “Complete Lineup.” Turns out that wasn’t quite accurate, because Heaven’s Door released a fourth whiskey shortly after its initial turnout, a 10 year old version of its Tennessee Straight Bourbon. While the standard bottling is just shy of seven years old, this limited edition release pushes it to a full decade. It’s also bottled at 50% abv, a full 100 proof. 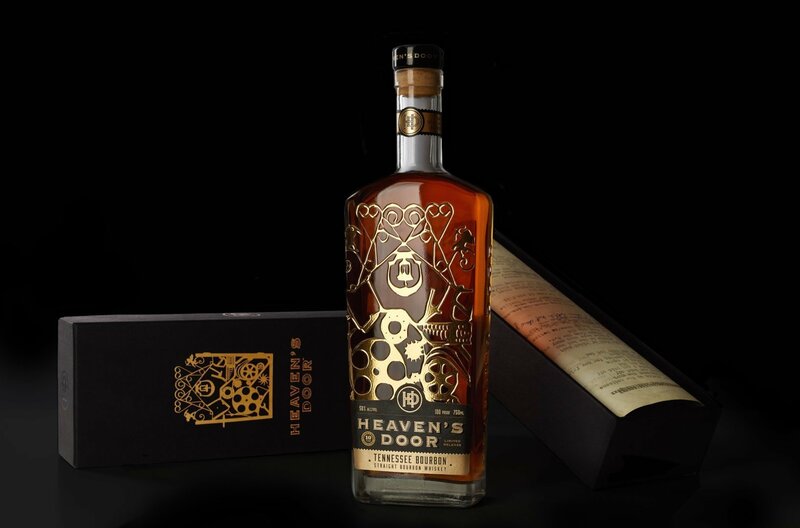 Heaven’s Door 10 Year Tennessee Straight Bourbon is mellowed using charcoal columns made from Tennessee sugar maple trees, a method traditionally known as the “Lincoln County Process.” The low rye content and a decade of barrel-aging renders a rich and full-bodied whiskey. On the nose, there is an aroma of fresh baked bread and nougat. The mid-palate mouthfeel is rounded out with semi-sweet flavors of grilled pineapple and candied walnuts. The finish delivers a perfect balance of sweet and savory with notes of cooked peaches and steeped tobacco. The nose of the whiskey bears a lot of family resemblance to the younger stuff, with an initial punch of sweet butterscotch, vanilla, caramel sauce, and some tropical fruit notes. A little air time in the glass is a big help here, coaxing out more of that fruity character. The palate is initially a bit heavy, as time and the barrel seem to have had their way with the underlying spirit; there’s a big rush of barrel char and lumberyard notes that seem immediately out of place with the move lively, fruity nose. The good news is that those fruity notes remain in the glass, albeit buried a bit by the woodier components, and they manage to squeeze their way to the fore as they reveal notes of torched banana, toasted coconut, and cinnamon. As with the standard Tennessee Bourbon, the combination makes me think of the tropics, tiki even, with a sweet, brown sugar kick on the finish that evokes notes of old rum. While I have to say I prefer the NAS version of Heaven’s Door Tennessee Straight Bourbon to this older — and much more expensive — version, it’s still plenty charming, and just unique enough to merit placing it side by side with the original.